Starting a blog has been one of the biggest rewards of my life. Not only has it given me freedom and independence as a stay at home mom to work from home while homeschooling my kids, but it has also helped me provide for them financially. See how I earn money from the blog. It’s true, more and more people are trying their hand at blogging, and the truth is, a lot of them don’t make much of a profit from it. For some, that’s ok, they started blogging as a hobby and a creative outlet. If you have seriously considered blogging, have a good eye for design and a passion for writing then it may very well be your calling! In fact, you can give it a try for as little as $3 a month! And if you’re super serious, I highly recommend getting started with an information packed course that will teach you everything you need to know. I personally started with Building a Framework. It will walk you through how to start, different ways to start your blog, how to choose your niche, how to promote yourself, how to write…literally all the questions you have: answered! Don’t be fooled, blogging is no over-night income but if you feel it’s your true calling and you have the drive to make it happen, then this could be the perfect work from home job for you! Because the world is such a digital place, there is a high demand for a variety of graphic designers! Whether you want to start by designing logos and layouts for wedding invitations or you want to get into web design and create websites for people. There are a variety of places like ThemeIsle and MyThemeShop that create WordPress layouts so other people don’t have to! Not to brag or anything, but I actually used to create MySpace layouts for people. I didn’t make a dime…I just had a lot of free time on my hands. But, the thing is, this type of stuff is in high demand and if you’ve got serious design skills, put them to use! Stay at home, work for yourself and start supplementing your income! Ok, this is one of those where you’ll probably be asked to wear pants on occasion. I used to do photography as a career and I know it can be highly beneficial and you can make a huge profit if you do it right! The best part is, there are so many ways to make an income from photography. You can take your own photos and sell them on sites like Smug Mug. Now, you may have to get some fresh air, invest in props and you will definitely have to know your stuff! But, the main part of photography is the editing and that my friend, takes place in pajama pants! Starting my own photography business was something I was easily able to build out of my home, working from home, being a stay at home mom, setting my own hours, doing something I loved and getting paid to do it! I recently took a course on how to make money with affiliate marketing. You can read my full review on the course here. Often times affiliate marketing goes hand in hand with blogging, but there are a variety of different ways to make an income from it and Pinterest is one of them! If you are naturally good at recommending products you love to friends and family, then affiliate marketing may be something to look into as an additional income source! You can also easily get started with affiliate marketing with sites like ShareASale and Awin that allow you to connect instantly with thousands of companies that offer affiliate programs. This is a real thing people! My eyes have recently been opened to the wide world of making money from home with Amazon! Essentially, you would start by purchasing items on sale, marked down at a discount and then selling them on Amazon for the asking price. Amazon, of course, takes this one step further than eBay did because you can actually ship all your product to Amazon to store and ship for you so you aren’t running back and forth to the post office on a daily basis! There are of course a lot of ins and outs with this, however, there are many people who have managed to supplement their entire household income and now have husband and wife both working from home! Check out the Why Selling on Amazon works FREE ebook! There are many different ways to be a virtual assistant and it can be totally based on the skills that you already possess. For example, if you are a fast typer, being a virtual assistant and typing dictated documents and emails for an employer would be something you could do. This could also mean answering their e-mails or handling their day to day online tasks! Transcription is a job near and dear to my heart because it is what my mom did when I was a kid. Sometimes she worked at a job and other times she was able to work from home. The days that I was sick, she was often able to pick up work to bring home with her so she didn’t have to miss a paid day of work! Her area of expertise was medical transcription, meaning she typed patient reports for doctors. While this left her with a lot of fears (like me getting my belly button pierced too deeply) it was a job that allowed a lot of flexibility. Today it is becoming more and more popular since more things are being done on computers. You don’t necessarily have to do medical transcription either, there are companies like Transcribe Anywhere that teach you all the skills you need to learn to transcribe and how to find jobs in the field when you’re done! I had a friend who did this for a while and I thought she was just the absolute coolest person in the world for it. While Stitch Fix is very limited to the cities they offer consultant jobs to, it can’t hurt to look! If you are a style orientated person who would love picking out clothes for other people, then I would definitely look into this as a work from home option! At a recent wedding I photographed for a friend, I couldn’t help but eyeball the ladies doing the hair and makeup; messy buns, and sweat pants. I have a friend who does this as well and it is so fun to see her before and afters. As I sat there watching these ladies work, it occurred to me, they got to make everyone beautiful, sip mimosas if they chose to, keep their comfy clothes on, and then take off before all the hustle and bustle began! It made me really wish I knew what in the world contouring was. If makeup and hair is your language, consider getting in on wedding season. Doing the hair and makeup of a bride, bridesmaids and maybe some family members, you can easily make out with $1,000 a day and be done working before noon! Spending the day painting and priming in pajamas sounds absolutely amazing. I mean, it’s how Joanna Gaines got her start. Check out a dresser I recently flipped. There are so many sites, blogs and online publications that will pay you for your writing! You can easily get started launching your dream job of writing today! There are places like Writers Work that will literally teach you how to find writing jobs, get published and even teach you how much you should be asking for compensation! When I created my first digital product, The Fun Sized Budget Bundle, I was so nervous! I had no idea where to start or what to do! Thankfully I got set up with a totally FREE plugin called Easy Digital Downloads! Creating your own products to help people thrive in certain areas of their life is so rewarding and can potentially allow you the freedom to work from home and start earning an extra income! Call me crazy but I didn’t realize you can actually create your own app! If you have had an idea tucked away that you know would be highly beneficial to the world around you, then I suggest looking into using Swiftic App Maker. This is great even if you already own your own business. Creating an app can make that that much easier to sell and engage with customers every day! Speaking of using an app for business, getting an app created for an online boutique is genius! You know when you see those adorable clothes all over Pinterest? Well, often times those are popping up from different online boutiques that are run out of people’s homes while they sit in their pajamas! I have had the privilege of watching a few friends of mine grow their online boutiques and it has been so great to watch! They can shop for a living and have created lucrative at home businesses! Plugins like WooCommerce make it easier than ever to get an online store set up so you can start selling right away! Plus, just like a blog, you can get your boutique set up for as little as $3 a month! If you are super artsy and love creating your own stuff, Etsy is a great place to do it! There are a wide variety of vendors who are able to work from home using Etsy as either a part time, side hustle or even as a full time income! If you have a great social media following, especially on places like Instagram and Twitter, you could be making some serious money by working with brands. There are a number of brands that are willing to work with social media influencers in order to promote their product! One blogger makes so much working with brands through her blog and social medias like Instagram and Snapchat that her husband was able to quit his job! She has an amazing course called Pitch Perfect, that teaches all the ins and outs of working with brands including how to approach them and how to much to charge! The best part is, you don’t have to have a big following to get started! Because she is so dedicated to each person she helps, she only opens the course a few times a year, but you can sign up to get on the waiting list! Again, the pajamas have to come off! But the great part is you get to decide when! When working with Uber you choose your own hours and it’s fast an easy to get started. Another great thing you may not have heard of is UberEATS. This is a newer branch of Uber where you get to deliver food instead of people! You can earn extra money when you need it day or night! With UberEATS you can even get started when you’re a little younger by doing your work with a bike or scooter! We all know someone in direct sales, am I right? I know sometimes it may seem al little pushy, but in reality this can be a great stay at home job that can earn you a full time living depending on how many hours you put in in a day. The one tip of advice I give strongly to anyone considering direct sales is that you had better love your product! Don’t push anything that you don’t fully back up. People will catch on and chances are, you won’t do as well with your sales. One of the top companies for female entrepreneurs that I recommend is Stella & Dot. This is a company run for women by women. You can sell product online from your own home or venture out. The choice is entirely up to you! There are different programs like VIPKid that allow you to teach English online! Just starting out you can earn between $14 and $22 an hour teaching English to children in 32 different countries! SayABC is another great online teaching company that allows you to teach from home, set your own hours and not have to worry about lesson planning at all. Don’t have a degree yet? QKids will hire people who are currently working on their degree at the university level! Start earning up to $21 per hour! Are you one of those people that always notices those little spelling mistakes on people’s Facebook statuses? If so, maybe a career in proofreading while working from home is for you! Through places like Editorr you can get connected with tons of different jobs that pay you to proofread blogs, eBooks and other digital content! If you are more the numbers crunching kind of person, why not consider bookkeeping? There are so many companies that are either just starting out or that have been around for years who could use your services. Everyone has to manage their money wisely but not everyone is very good at it! Sites like Bench.co allow people the freedom to run their business while they run the books! You can easily check their sites to see a list of current openings! So you might have to get up earlier than the sun, but you can do it in your pajamas, sip some coffee and listen to music! Delivering newspapers isn’t what it used to be, in fact most cities are hiring for newspaper deliverers all the time and the pay is pretty reasonable! This is similar to a virtual assistant and may often be something you can offer as a skill set but is something that can be a job all in itself. If you have managed to grow your social media presence into a huge, highly influential brand, then there are going to be companies or other influencers that might very well be interested in working with you! This would mean posting to social media, interacting with followers and working to increase engagement and followers. By doing something you do best you can easily have a work from home job that pays up to $60,000 a year. Opinion Outpost – Opinon Outpost is a a survey site that pays you for your opinion! Springboard America – Springboard America is a survey company that is interested in the learning more about the values, attitudes and taste of Americans. By signing up you will even be entered to win $1,000. Maru Voice– For those Canadians hoping to make some extra cash by voicing their opinions, Maru Voice is a great outlet. Angus Reid – Get paid for your opinions. Similar to telemarketing, there are multiple companies that have people working from home to schedule appointments for them. This might be for a clinic, counselor or other professional service. While this type of work requires a quiet, uninterrupted work space…that doesn’t really sound like a bad gig! If you have basic computer skills and are able to work quietly from home each day, then this is a great work from home job to consider! No matter what jobs might be of interest to you, make sure you are taking the right steps and doing it in a professional manner. Seek out other professionals to help you create a resume, manage keywords, and all around help you prepare a professional image for yourself that will appeal to employers. There are easy to work with places like Jobscan that can help you with all of this. 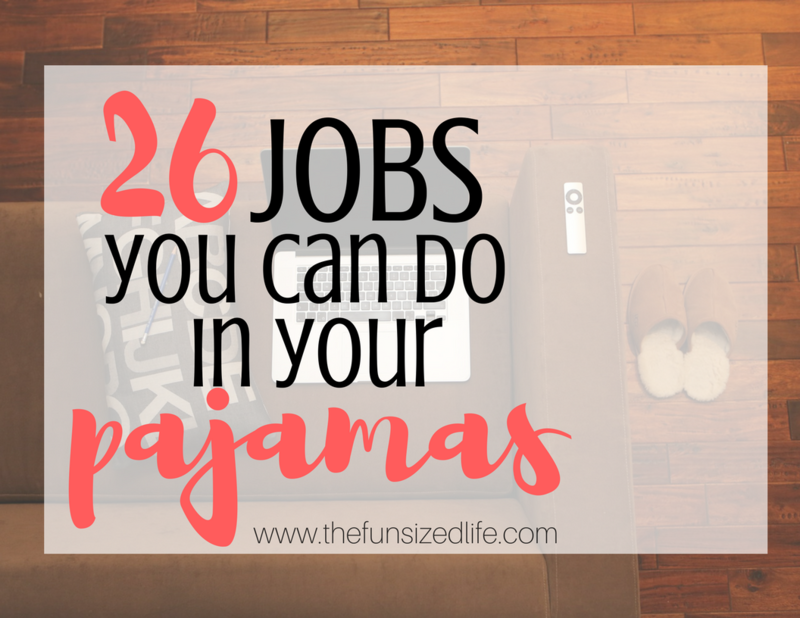 If working from home and staying in your pajamas is a dream of yours, then don’t hesitate to take the steps to make it happen!